With the season opener of the Pirelli World Challenge (PWC) only a few weeks away at the Circuit of the Americas, I thought it would be a good time to look back at last year’s 25th anniversary season. The PWC series combines some of the best aspects of sports car racing including speed, noise, excitement, glamour, and a wide variety of manufacturers with great looking cars. This review will focus on the GT and GTS classes. Here’s part 1. Hope you like the photos. 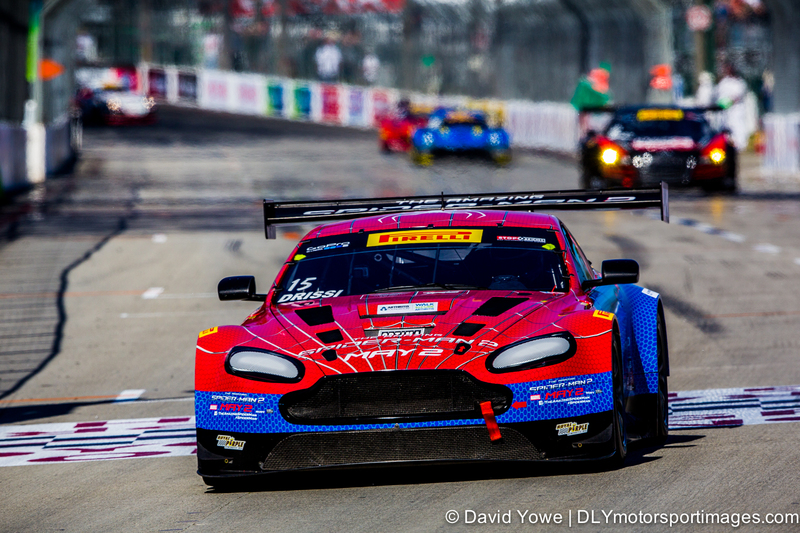 The 2014 season started at the end of March on the streets of St. Petersburg in Florida. 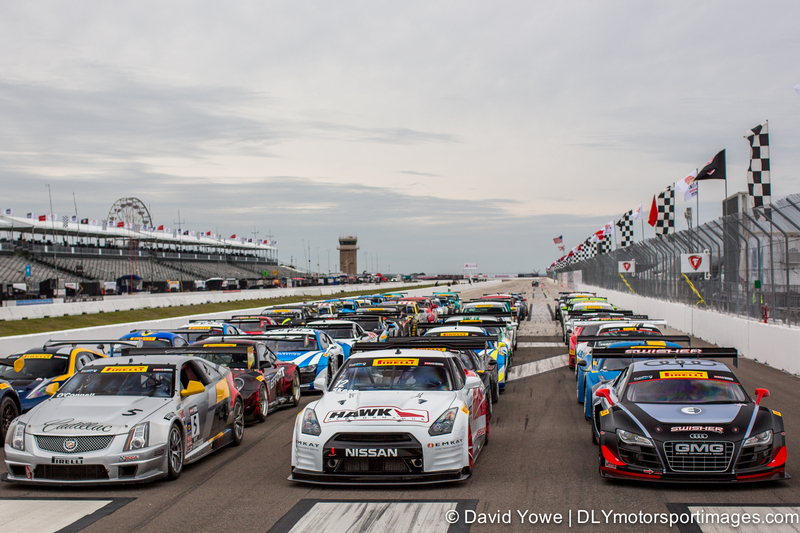 Seeing over 100 sports cars lined up on the front straight before the race weekend was a sight to behold and added to my excitement for the season to begin. 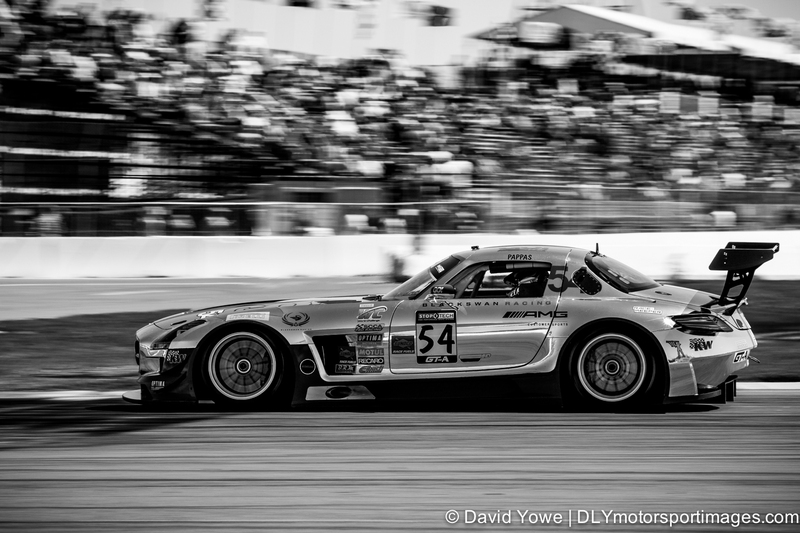 Even in black and white, the chrome livery of the #54 Black Swan Racing Mercedes-Benz AMG SLS GT3 shines through as Tim Pappas speeds past race fans. 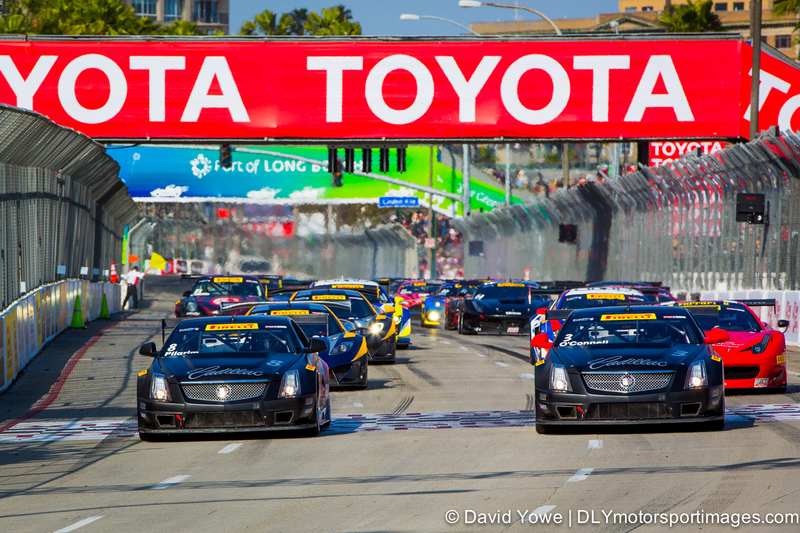 In early April the series headed west to the streets of Long Beach California to compete in the “Roar by the Shore”. Cadillac Racing had a dominant weekend with their cars qualifying in the top positions, and Johnny O’Connell in the #3 Cadillac CTS-V Coupe winning the race. Have always been a comic book fan, so you could imagine my excitement when I saw the Spiderman 2 livery on the #15 Drissi Motorsports TRG Aston Martin GT3 being driven by Tomy Drissi. The front straight was one of my favorite places to photograph, since one got a real sense of speed as the cars raced mere inches from the side wall, as shown by Andrew Palmer in the #21 Global Motorsports Group Audi R8 Ultra. 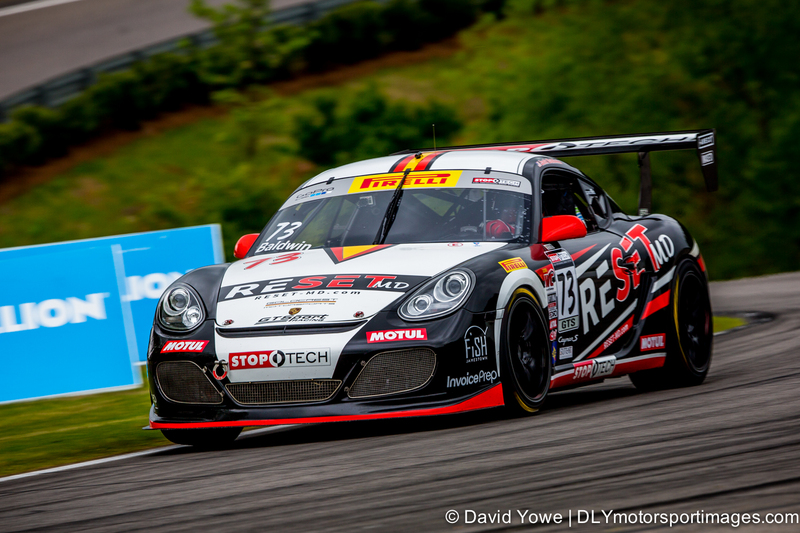 At the end of April the series headed back east to Barber Motorsports Park in Birmingham Alabama. 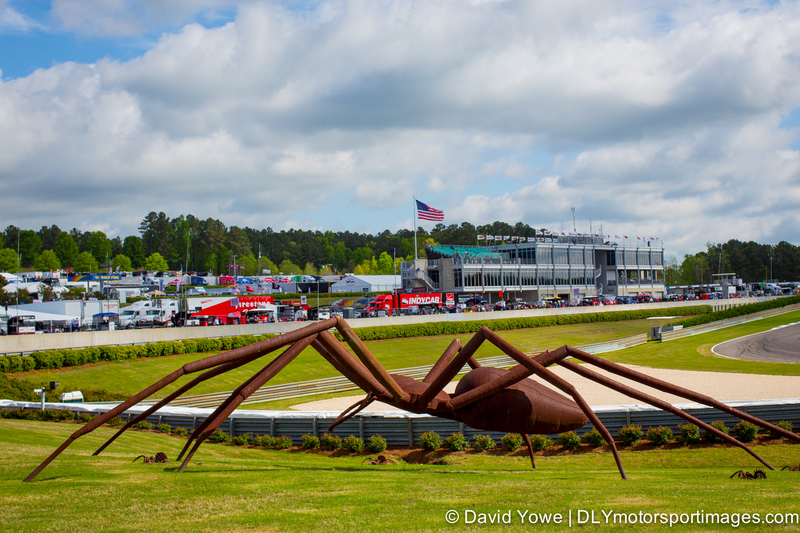 This was one of the most picturesque race tracks I had been to, with beautiful landscaped infields, sculptures, and spiders! Car racing is about people and emotion. 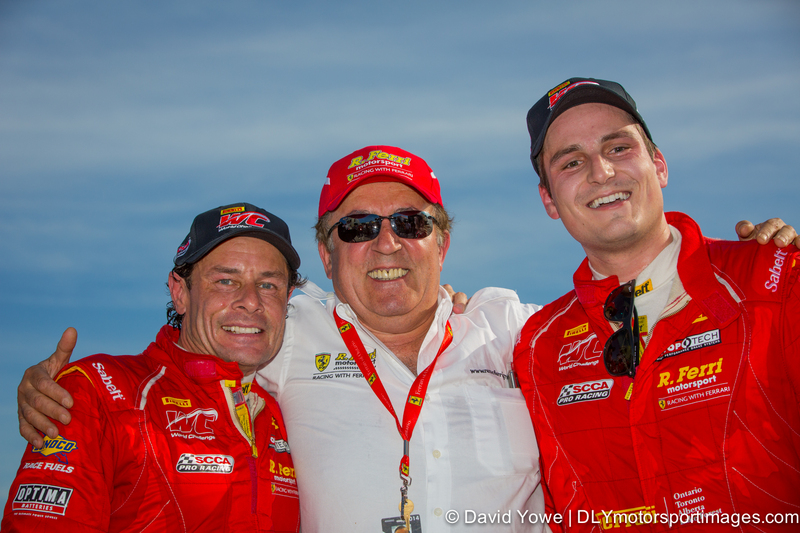 That’s why I like this shot of Anthony Lazzaro and Nick Mancuso after their clean sweep of Round 3 in their R. Ferri Motorsport Ferrari 458 GT3 Italia’s. Jack Baldwin in the #73 GTSport Racing Porsche Cayman S had an incredible weekend with a win and a third place in GTS class, especially when you consider the major set-back at Long Beach. 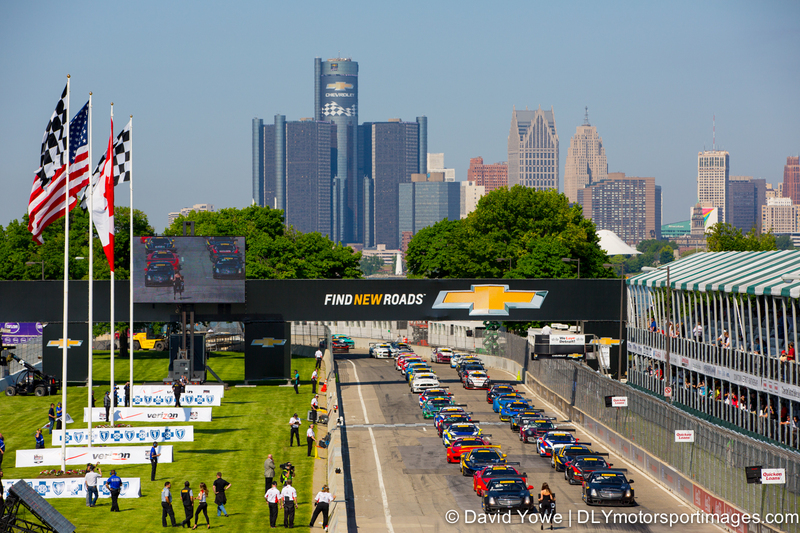 At the end of May the series headed north to the streets of the Motor City for the Chevorlet Detroit Belle Grand Prix. Here is the glamor of the PWC Flag girls in front of Johnny O’Connell’s Cadillac Racing Cadillac CTS-V Coupe, who would go onto win both races. Countdown to the race start, with the iconic GM Building in the background. 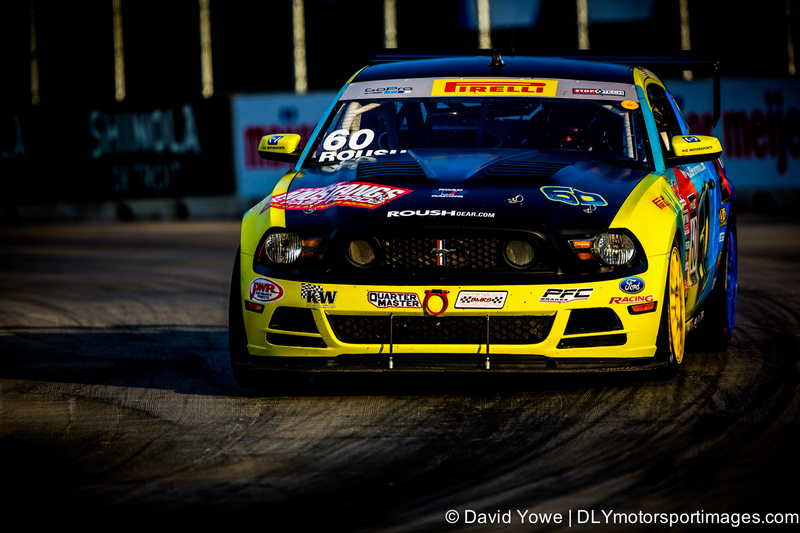 Even on street circuits, you have opportunities to capture the cars under beautiful light, as shown with Jack Roush Jr. in the #60 Roush Road Racing Ford Mustang Boss 302R during early morning qualifying. 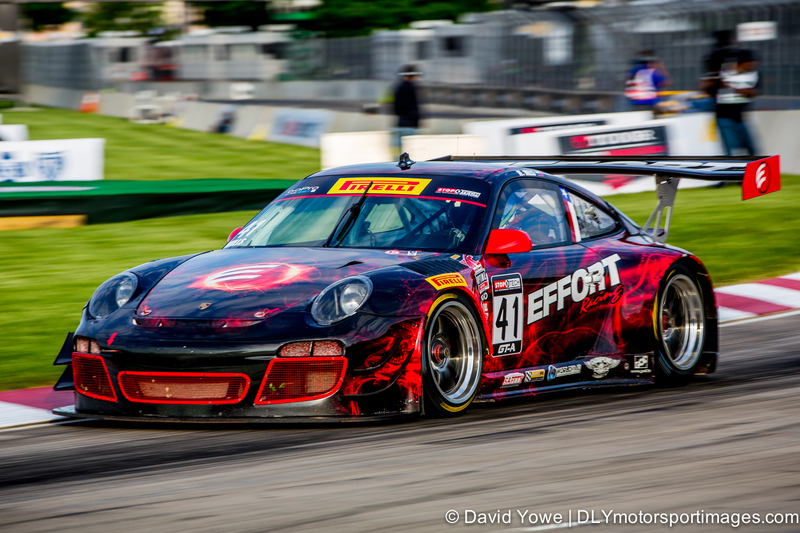 Another one of my favorite cars to photograph is the EFFORT Racing Porsche GT3R with its beautiful black and luminescent red livery. Here’s Michael Mills in the #41 speeding around the corner at the end of the front straight. 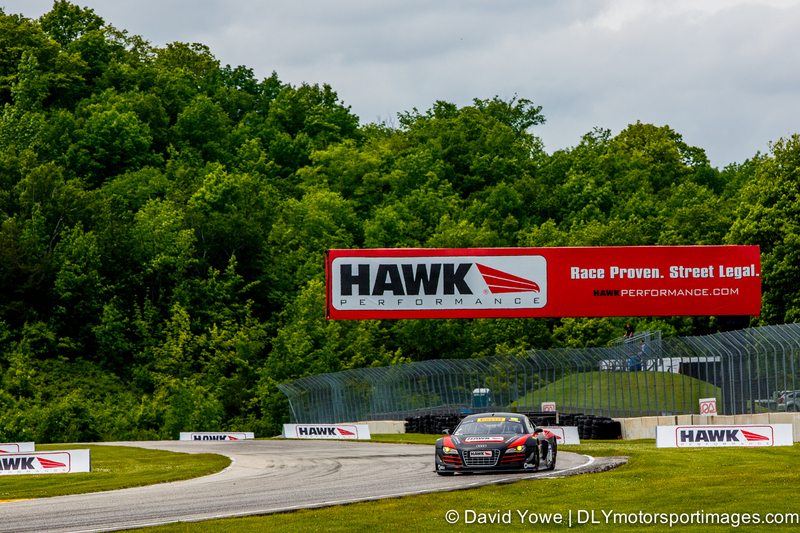 In mid-June the series went to Road America at Elkhart Lake in Wisconsin. 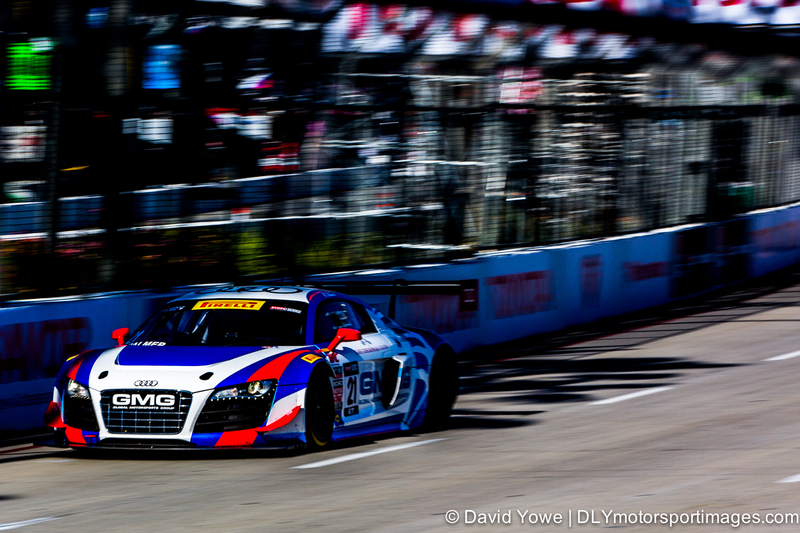 Mike Skeen in the #2 CRP Racing Audi R8 LMS Ultra had a great weekend with back-to-back wins. 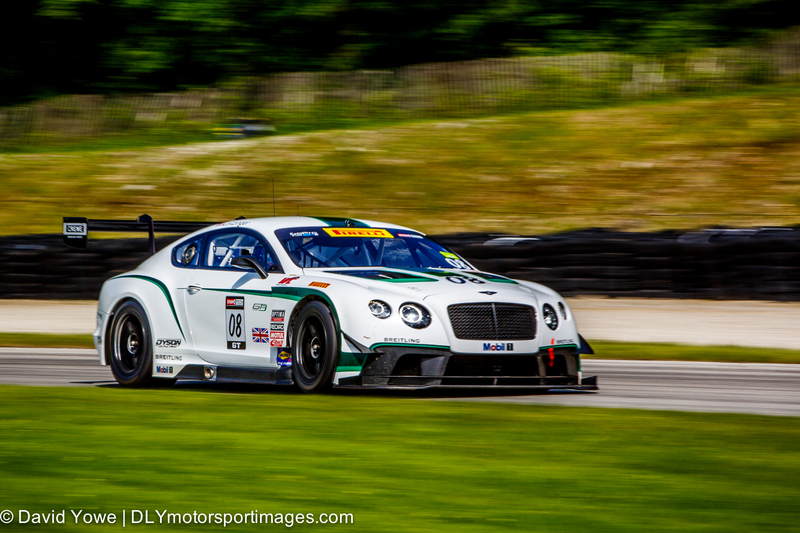 This race also signified the return of Bentley Racing to North American autosport with the #08 Dyson Racing Team Bentley V8 T driven by Butch Leitzinger. What a really cool looking car! 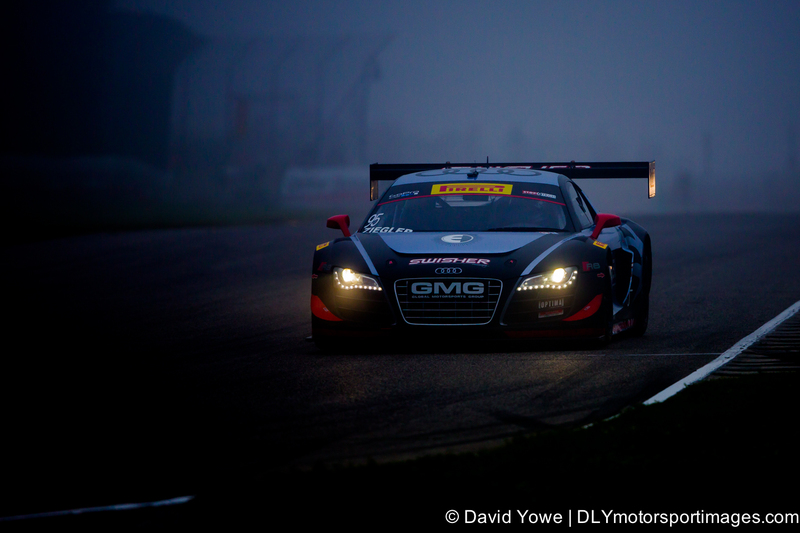 Early Saturday morning practice was greeted with heavy fog; that meant cars ran with there headlights ablaze as shown by Bill Ziegler in the #95 Global Motorsports Group Audi R8 Ultra. Hi David, great images again. Definitely the Black Swan SLS is great, good choice to go for B/W. Also the dynamic image of the Effort Porsche I like a lot! Looking forward to new images from you!